I am located at 399 Pembina Hwy, 2nd floor. I am about 4 blocks south of confusion corner (corner of Osborne St and Pembina Hwy). 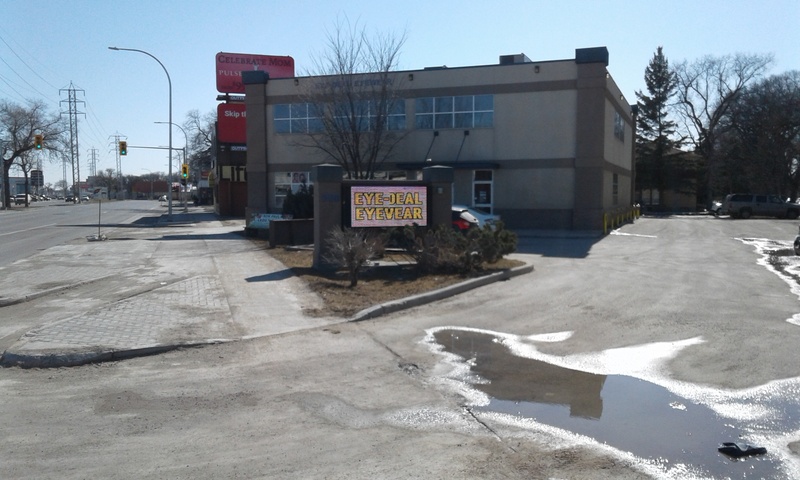 I am directly across the street from the Pembina Animal hospital. The main floor of the building has an eyeglass store called EyeDeal Eyewear. Lincoln is a graduate of the West Coast College of Massage Therapy in Vancouver, British Columbia and of Brandon University in Brandon, Manitoba. Aside from practicing therapeutic massage, he offers sessions in Esalen Massage, Hawaiian Lomi Lomi massage, Traditional Thai Yoga Massage and Rolf Structural Integration. Lincoln completed his Esalen Massage training at the Esalen Institute in Big Sur, California. He did his Structural Integration training at the Northwest Center for Structural Integration in Portland, Oregon. He completed his Hawaiian Lomi Lomi massage training with Wayne Powell and Patti Miller of the Shamanic Bodywork School in Vancouver, BC and took his Thai Yoga massage certification from Jasmine Mah of the Organic Therapy Clinic in Winnipeg, MB. Lincoln has practiced for many years in Vancouver and in Winnipeg and currently has a practice in the Pembina and Grant area of Winnipeg. Lincoln is a registered member of the Natural Health Practitioners of Canada Association. Vitality Massage Therapy Clinic provides Esalen Massage, Hawaiian Lomi Lomi Massage, Thai Yoga Massage and Rolf Structural Integration. All services are by appointment only. New patients, please arrive 10 minutes early to fill out forms. For the Thai Yoga massage sessions, please bring loose fitting clothes to change into, such as yoga pants or sweat pants and t-shirt. For the Structural Integration Sessions, please bring shorts and a t-shirt/ loose fitting top to change into. Receipts issued for all services and can be used for insurance purposes. We also direct bill for Manitoba Blue Cross and Great West Life. Plan information must be given in advance of appointment to allow time to set up direct billing. 24 hour notice required for cancellations. There is a $40 service charge for cancellations shorter than 24 hours and for no shows. Vitality Massage Therapy Clinic only takes patients 18 years and older. Please notify therapist if you have any oil allergies, specifically to coconut oil, mineral oil or essential oils/ fragrances. A. Is Hawaiian Lomi Lomi massage a spa/relaxation massage? Q. Although Lomi Lomi is very relaxing and is often found in spas in the United States, it is also a deeper therapeutic massage using mainly forearm and elbow strokes and can release tight and sore muscles. Q. Do I have to be flexible or do yoga to get Thai yoga massage? A. No, although Thai massage can be challenging in terms of the stretching, each session is individually tailored to the needs of the patient. People with all ranges of flexibility can benefit from Thai massage. Q. Does the patient wear clothes during a Thai yoga massage? A. Yes, loose fitting clothes like sweat pants/ yoga pants and t-shirt. Q. Do I have to commit to do all ten sessions to get the Structural Integration Deep Tissue massage? A. No, for people who are interested in getting the Structural Integration sessions, I suggest their first session be a generalized session. After, if they think it is for them and they would like to commit to the ten session series, we would start with session one, and space the sessions one month apart. The patient can end the series at any time. A. I use mineral oil or coconut oil for my massage sessions, except for Thai massage and Structural Integration, which uses no oil. Q. Are there any female registered massage therapists at this clinic? Q. Should I eat before/ after a massage? A. It is best to have an empty stomach or just a light meal prior to a massage and also immediately after a massage. It is recommended to have some water after a massage to rehydrate. Q. How do I prepare for the massage? A. If you are a new patient, you will need to arrive 10 minutes early to fill out a case history form (double sided). When the therapist is ready, he will come and get you from the reception area and show you to the massage room. There, you will have privacy to undress (keeping underwear on) and get onto the massage table face down. Place the top sheet over top of yourself and wait for the therapist to come in. It is recommended for females to remove their bras so their back can be worked on. There will be a sheet covering the private areas at all times. Q. Why do you not take patients under the age of 18 years? A. My practice is geared towards adults. There are therapists and clinics in Winnipeg that specialize in "family practice" that includes parents and children. Its mainly personal preference. Q. How often do you change the massage sheets? A. The sheets are changed with clean ones between each appointment. Q. What taxes do you charge? Q. What kind of payment options are there? A. Cash or cheque only. Debit and credit card are not available at this time. Q. Do you direct bill for insurance plans? A. I direct bill for patients who have massage coverage with Blue Cross and Great West Life. People who have massage coverage with other insurance companies have to pay up front and submit their receipt to their insurers. Q. Is there free parking at your building? A. Yes, there is free parking in the parking lot. Q. Do you do pregnancy massage? A. Yes, but only from the second trimester onwards. Let me know that you are pregnant when booking your appointment. Q. Do you take walk in appointments? A. Not at this time, as there is only one therapist working at this clinic.